It was revealed in Green Lantern Corps: Recharge #1 that the ring of sector 1417 (where Korugar resides) needed a new bearer. The ring joined with Soranik Natu, a neurosurgeon who, like most citizens of Korugar, despised the Green Lanterns and everything they stood for. She only accepted the ring's power in order to save a patient who she was operating on. 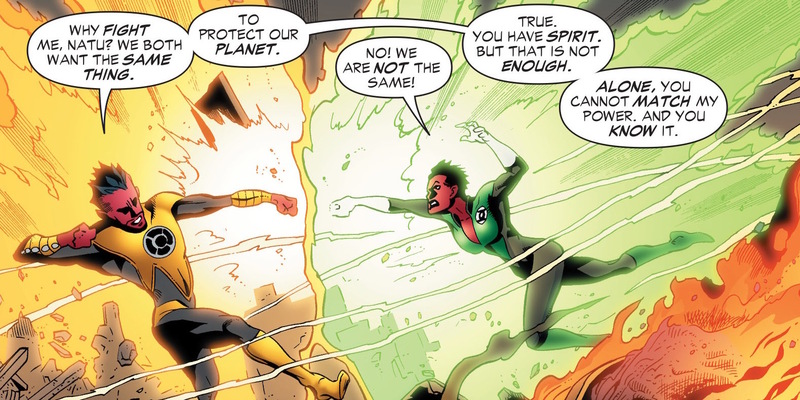 Soranik went on to join the Green Lantern Corp and even became romantically involved with Kyle Rayner. It was later revealed that she was the daughter of Sinestro, who confronted her during the Sinestro Corps War storyline. Despite being an evil despot, Sinestro does have affection for his daughter. He eventually welcomed her into the Sinestro Corp under his leadership.